What with the Sea Vixen lacking a pilot and the Vulcan unserviceable, Kemble's lineup for 2010 was without a star attraction. However with thoughts of blue notes and avtur in mind, UKAR set off on the Saturday to investigate whether Gloucestershire's second-most famous airshow - continuing in the two-day format introduced last year - has still got enough of the right stuff to secure its place in the aviation calendar for years to come. 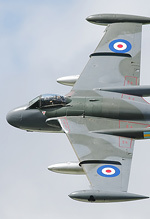 Ben Hughes reports for UK Airshow Review. Photos by the author, Steve Buckby and Ian Matthews. 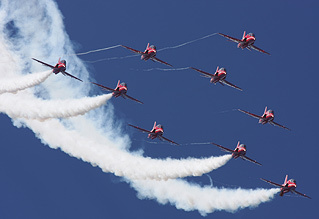 Airshows are now getting to the stage where the participants seem to come in one 'bumper-pack' set menu touring the country as one, thus rewarding the more avid aviation enthusiast little variation in line-ups at events across the country. Kemble (or the 'Cotswold Airshow' as it has been somewhat unnecessarily renamed) is one of the luckier venues in the fact that it has a vast array of based aircraft that the organisers can slot into the programme to spread out the bread-and-butter Hawks, Tucanos and Extra 300s. "This is my fourth year as a volunteer with the Kemble Events Team as part of a great bunch of volunteers who are here a week before the airshow getting the site set up for this big event. A lot of hard work goes into making this show happen and once again the volunteers have done a superb job. The flying display was superb and, as I'm known as 'Red 13', I was pleased to see the Arrows displaying at the show on both days. 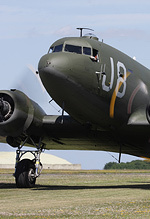 I now will have a little rest before I look forward to setting up the airport again for the Battle of Britain Airshow in September and then my fifth Airdays event next June." This year's display highlights included a very polished routine from Dakota 'Juliet Eight' which featured enough topside passes to keep even the most critical photographer contented, and a slick performance by a brace of de Havilland Venoms from the Classic Flight at Coventry. The location of RAF Brize Norton, only 15 miles to the north-east, means that Kemble is usually well supported by the based squadrons. 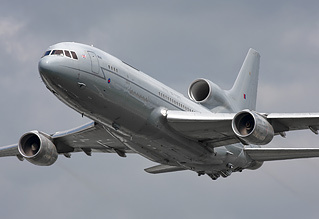 This year the show bagged a VC10 on static display, which was doing a roaring trade in guided tours, and a 'surprise' flypast from a TriStar. In addition to these were the usual fare of the Yakovlevs and the Swift Glider team to add a touch of aerobatic action. Towards the end of the the après le déjeuner half of the programme a Battle of Britain re-enactment took to the air, with a Messerschmitt Bf108 falling foul to the 'guns' of two Hurricanes owned by Peters Vacher and Teichman. A smattering of pyrotechnics were set off for that extra visual punch and, for reasons nobody could fathom, a de Havilland Dragon Rapide also participated by meandering around the airfield. Speaking of meandering, the four Jet Provosts that performed as a solo and formation of three could do with taking on some advice from the tight formation flying seen by Team Viper who fly a quartet of Strikemasters, the docile old JP's younger, slightly hyperactive brother. Whilst the lead aircraft performed some satisfying passes and breaks, the remaining aircraft seemed to fly as if imitating a drunken conga line. This was, however, entirely appeased by a fluid line-astern run-and-break from crowd left, highlighting the little basic trainer's grace in the air. Anyway, it was their first public display together, so allowances must be made, and it is clearly not outside the expertise of the crews to put together an impeccable display in the future. Staying with the topic of run-and-breaks for a jot, the RAF's Red Arrows' weekend got off to a rather inauspicious start when the ten aircraft appeared to bunch together in the circuit following a run in from crowd left, leading to four of the aircraft having to go-around. All in all, not the best we have seen from Kemble by quite a way. Before next year's show, the organisers should go and take a look at the shows of times past; there really is nothing like seeing the RAF of those halcyon days being flown fast and low down the display line. It seems that focus has been lost somewhat, and it would be great to see the show turned around to its former self. However with a few high-profile participants and some pleading with the weather gods you can be sure that Kemble has the capacity to grow in strength year-on-year, and provide a classic jet airshow experience unlike any other in the UK. "I attended on the Sunday. By and large, I thought it was a very well organised affair, with the static and the showground well laid out, and the flying display full of variety. Kemble does seem to have moved away from being a classic jet-only affair, and I admit to having mixed feelings about that." "A truly fantastic show one of the best I have been to for some time. The Reds were just brilliant considering the problems they have had this year but the highlight for me was flying into and out of the show in the Skyvan. The only complaint I have is of the multitude of vehicles driving up and down in front of the crowd line. I know they have a job to do but they could pick their moments better."" "We did have a lot of Jet Provosts/derivatives, when one of them could have been sacrificed with a Gnat or something. There have been slightly better Kembles, what with the unique formations, and yes, I'd like to see it return to mainly classic jets with a few classic props thrown in, but it was still a great show!" "I'd like to add my appreciation to everyone concerned with organising and running the event - and not forgetting the traffic marshaling guys who did a sterling job. I had the smoothest entry and exit of any airshow I can remember. The flying display itself was top notch - an excellent mix and well choreographed with no flat spots. I also liked the 'lunch-break', which worked well."